The ANKYLO sandblaster will be the blaster that you reach for on nearly every job. You'll come back to this blaster for start-to-finish small and medium jobs, and for those tight spots and hard-to-reach areas on larger jobs. And when the work is done, set the material flow valve to "Off" and use this gun to blow your project clean. 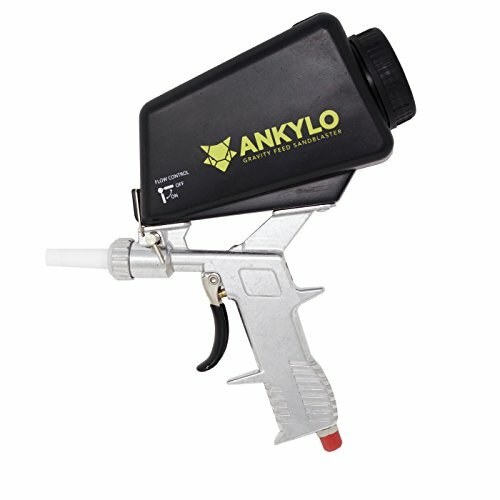 The portability and versatility of the ANKYLO sandblaster makes it an invaluable tool to have around the garage, construction site, studio, driveway, and backyard. The most durable gravity feed blaster on the market! The strong aluminum body resists cracks, bends, and chips that cheaper blasters are subject to. The ceramic nozzle is much harder than steel and will last up to 5-10x longer; if the nozzle does eventually wear out, it can be easily removed and replaced. The ANKYLO sandblaster is meant to be used and abused for years. Works with all blast media! Sand, silicon carbide, steel grit, walnut shells, glass beads, and many more. The oversize tank allows you to fill as much as you are comfortable holding, so you can blast longer and get jobs done quicker. A removable spot blasting kit is included! When attached, four rubber tips allow for precise blasting along inside edges, corners, and on small screws and rivets. The tips create a seal against your target and media is collected in the recycling bag to be reused - for reduced cost and mess! The ANKYLO sandblaster operates flawlessly with a wide range of compressors and specifications: From 60- 125 psi, with optimal operation occurring at 70-80 psi and 10-12 CFM. THE TOUGHEST gravity sandblaster on the market: Lightweight and durable aluminum body and long-lasting ceramic nozzle (replaceable); BONUS media reclaim kit with 4 versatile rubber tips for spot blasting with precision! ANKYLO builds tough tools for tough jobs. Your satisfaction guaranteed - backed by our 30 day money-back guarantee and round-the-clock support team. If you have any questions about this product by ANKYLO Tools, contact us by completing and submitting the form below. If you are looking for a specif part number, please include it with your message.